Flipping through a food magazine in the kitchen last night I had a moment of self-discovery, handily delivered by a nifty magazine sidebar fact: “A new study shows there’s a genetic enzyme in saliva that makes some people more prone to craving soft-serve ice cream, pudding and other foods with similar textures.” Frozen yogurt? Definitely a fan. But what leads me to believe my textural cravings might be genetic is my unfailing love of rice pudding. My family has always been skewed firmly towards the rice end of the rice/potatoes continuum. My grandparents’ table is never without a lidded glass dish of brown basmati, and after my parents received a Persian rice cooker 10 years ago a giant rice dome tinted yellow with saffron has graced the table at almost all our dinner parties. I personally encountered rice nirvana rather late in life, when I discovered sticky coconut rice at a Thai food joint on Amsterdam Avenue my sophomore year. 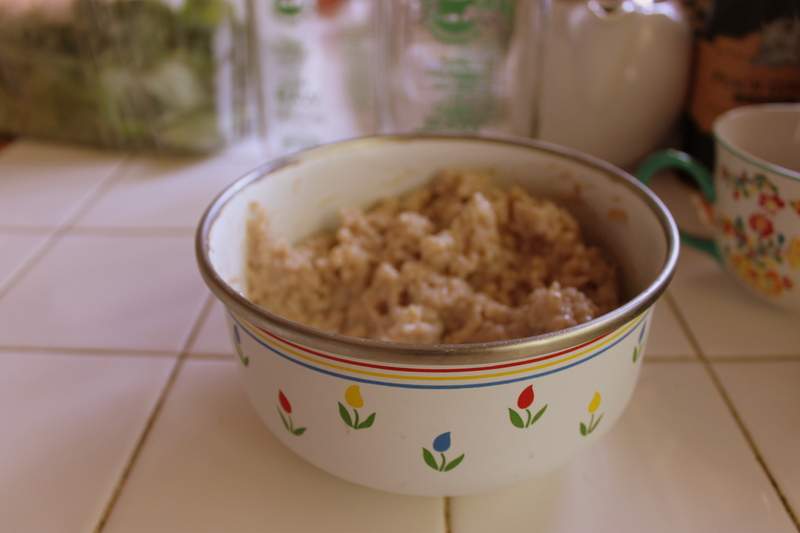 The fact that I got serious food poisoning from the place and went on to make my version of coconut rice pudding every night for months is a testament to my love (and obsessive food tendencies). Maybe it was the lone can of coconut milk on the dusty top shelf of our communal kitchen. Maybe it was the nine jars of goats’ milk filling the upper level of our fridge. Either way the end result was that a few nights ago I fired up the electric stove for a hybrid goats’ milk/coconut rice pudding, stirred lovingly for almost an hour and plied liberally with honey, cinnamon, and salt. We enjoyed it warm after a hearty dinner of chard and eggs (two other farm staples hogging the fridge), but I liked it even better the next day when, starving from a four-hour battle with waist-high foxtail weeds, I ate it straight from the refrigerated pan with the certainty that my DNA fully justified my behavior. The key to good coconut rice? Salt. A good rice pudding? Cinnamon. Use lots of both and the effect is magical. Also I tend to go with brown rice for a slightly healthier version, but whether you use brown or white keep in mind that shorter grains make for a stickier end result. In a medium-sized saucepan, heat 2 1/2 cups of water with a 1/2 cup coconut milk. Cook your rice as directed, and when it’s barely done add the rest of the coconut milk and stir until thick and creamy. Add the milk in two or three doses, waiting each time until the liquid is fully absorbed and stirring regularly to prevent the bottom from sticking. Add the honey and taste for sweetness. Lastly season generously with cinnamon and salt before removing the saucepan from heat to cool and settle before serving (or diving in with a spoon).